Monitor, log and control oxygen and temperature in up to 24 independent tanks from a single computer with wireless Bluetooth communication. Fiber optic oxygen sensing technology in combination with a high-precision temperature and real-time compensation, offers unbeaten accuracy and stability of oxygen data as well as zero sensor maintenance. 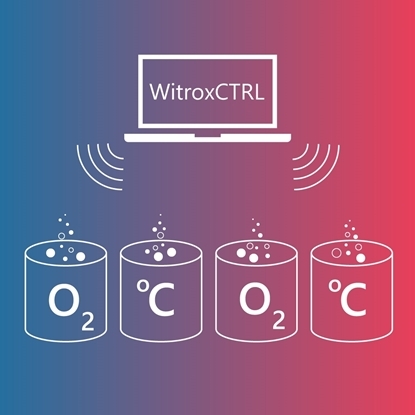 The user-friendly WitroxCTRL software makes it easy to calibrate, change measuring units, and set up automated protocols for changes in oxygen and temperature in steps or in a sinusoid manner (e.g. to mimic natural fluctuations like diurnal changes in oxygen saturation or temperature). The systems comes with all the necessary hardware and software, except for a Windows PC.